Instagram may need to introduce a new filter: white-hot. The photo-sharing app showed strong growth in 2013, according to a report by GlobalWeb Index. While Facebook showed -3-percent growth in active users, the behemoth social network’s photo-sharing sister service gained 23 percent in active users. Reddit is the second-fastest growing social site, with a 13-percent increase, followed by LinkedIn at 9 percent. 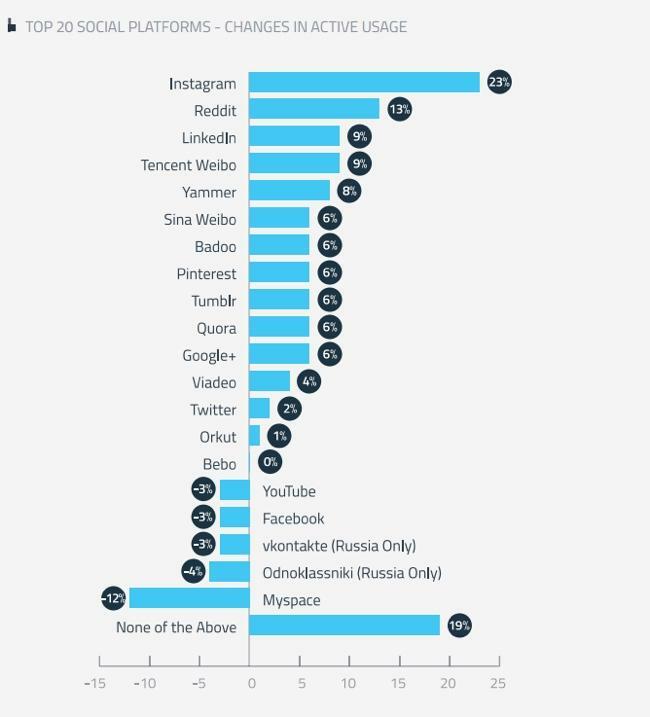 GlobalWebIndex, which is an international marketing research firm, based these numbers on a survey they took from 170,000 users in 32 countries, TechCrunch reported. China’s data was not presented, but its Sina Weibo still showed 6-percent growth – quite impressive considering the country it is based in did not participate. Additionally, Tencent Weibo, the Chinese Twitter to Sina Weibo’s Facebook, showed an even bigger increase, nabbing a 9-percent hike in users despite the lack of Chinese participation. Digital Trends asked Jason Mader, the Head of Trends of GlobalWebIndex, if he was surprised by any of the results. “I’m constantly surprised by how high Facebook penetration is in some of the emerging markets like Indonesia,” he wrote in an email. And Facebook, despite rumors of its impending demise, continues to succeed on several fronts. Also, let’s not forget that Facebook owns Instagram, so a gain in users for the photo-sharing service is really just a win for Facebook under a different name. The report also highlighted the increasing importance of mobile, and Facebook didn’t come out so bad there, either: Facebook’s primary app is the most popular social mobile app, plus its standalone messaging app, Messenger, is the fourth most popular. Instagram is eighth, so altogether, Facebook continues to dominate mobile apps. Of course, give it time: Unless Facebook does a better job at courting younger users, these numbers may change dramatically.